WWE Hall of Famer Kurt Angle made his return to in-ring action at the Royal Rumble and will have another chance to wrestle tonight. 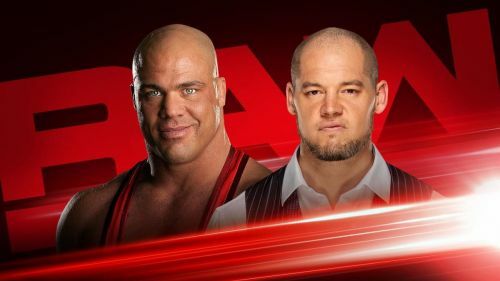 The company announced three matches for Monday Night Raw including Angle vs. Baron Corbin, Braun Strowman vs. Drew McIntyre and qualifying matches for the Women's Tag Team Elimination Chamber match. Angle served as the general manager of Raw from 2017 to 2018 until he was suspended by Stephanie McMahon and replaced by Corbin. The Olympic Gold Medalist has wrestled sporadically since losing his status as GM, but has not wrestled a singles match since his loss to McIntyre in November. Angle and Corbin had little to no interaction in the Royal Rumble match, but the two have been at odds with each other since Stephanie's decision to make Corbin another authority figure on Raw. Corbin and Angle's last confrontation took place in the buildup to the World Cup Tournament for Crown Jewel. Angle came to the ring disguised as El Conquistador and eliminated Corbin to win the qualifying match. Strowman vs. McIntyre was also announced for the show and will be the first singles match between the two. Their alliance ended in October, but they've only competed in tag team matches since the split. The final match(es) announced for Raw were the women competing in qualifying matches for the Tag Team Elimination Chamber match. There are fourteen women on Raw roster, but only a few women are a part of tag teams that have already been established. Rousey's participation in the qualifying matches is unlikely due to her being the current Raw Women's Champion, but there is still the chance she teams with Natalya. However, Banks' status for the qualifying match is even more questionable following her post-match interaction with Rousey at the Royal Rumble pay-per-view. Banks still could either lose a qualifying match due to Rousey's distraction or move on from their feud if she participates, but that is pure speculation.